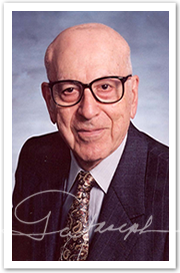 Founder and Chairman of the Board Mercury General Corp.
Born Sept. 11, 1921, Joseph was raised during the heart of the Great Depression by parents who emigrated to the U.S. from Lebanon. His father worked as a coal miner and storekeeper in Beckley, West Virginia ("The Gateway to Southern West Virginia"), where the family raised pigs and chickens and grew vegetables. "Even though West Virginia was a very depressed state, we had a small plot of land and we managed to survive," says Joseph. "We were very proud people and, thanks to my mom, who insisted I get a good education, I've been able to do OK."
Joseph volunteered for military service prior to World War II, leaving the coal mines of the Appalachians in the spring of 1941 for Kelly Field, Texas...then came December 7, 1941. "All of the guys I was serving with in the Air Force were well aware of the conflicts in Europe and that we'd likely see actual combat, so once Pearl Harbor happened, we were almost relieved we'd finally get to serve our country overseas." Joseph was assigned to a North African-based B-17 crew in late 1942. Because of his affinity for math, he was the crew's navigator for 50 missions that ranged from bombing runs over Tunisia to supporting Allied efforts to take Sardinia, Sicily and other parts of Italy. Joseph was nearly 24 years old when the war ended. He quickly found a job, applied for admission to Harvard (on the GI Bill) and was married in June 1946. "I was anxious to get going with my life," he says. "I was also anxious to get out of school as quickly as possible, so I took more courses than the average student and finished up quicker." He graduated Harvard in a snappy three years, but certainly didn't take the easy route. Joseph majored in both math and physics. "Harvard had a terrific reputation and was the pinnacle for learning, so once I graduated (in 1949) and moved on in life, I couldn't blame any failures on lack of education," he says, harking back to his mother's admonition. "I did, however, want to work on guided missiles once I graduated, but I found I needed a Master's degree. I couldn't wait for that, so I went to the library to do research and read about actuarial programs that insurance companies had. It was basically mathematics, so that was a natural fit for me." He began working for the Occidental Life Insurance Company in Los Angeles within a few months. "The actuarial work was very interesting, but there were limits on what I could do with that," he says. "I learned a lot about hard work from being a child of the Depression, so I also began working evenings as a life insurance salesman. Soon, I was making more money at night than I was making all day long." A lot of his customers began asking George about auto and home insurance, so he tried to persuade Occidental management to allow its agents to offer a full line of coverage. When the company declined, his remedy was to begin packaging auto and home insurance from another company with the Occidental life policies he was already selling. This led to his belief that the private passenger auto insurance system simply wasn't very flexible. Back in the '50s, everyone paid the same rate, regardless of their driving record. Joseph decided he could create a new system by developing an insurance company that used different factors to create fair and equitable rates for a variety of drivers. Armed with a belief that there was a better way to provide insurance to California drivers, he managed to raise $2 million in start-up capital and his new company sold its first policy on April 1, 1962. "We called our company Mercury, because I wanted us to be fast and nimble, just like the Roman God of business and merchants," says Joseph. "He was also responsible for delivering good news to people on Earth, which is exactly what we do for Mercury customers every day." Now in its 50th year, Mercury has employed nearly 20,000 people and paid out more than $20 billion in claims since the company opened its doors. In fact, Mercury pays out as much as $5 million a day to make its customers whole while providing a reasonably priced alternative to other insurance companies. "Mercury has always prided itself on offering quality insurance at affordable rates. These are the core values that distinguish Mercury in the marketplace," says Joseph, who turned 90 in September, still goes to his LA office five days a week and plays a little tennis twice a week. If that's not enough to keep busy, he is also actively involved in California politics. "I learned a long time ago that if you're not active in politics, then you can't create change that benefits the consumer," says Joseph, who is currently involved with legislation for the November 2012 California ballot that will allow insurance companies to offer discounts to new customers who have had continuous auto insurance coverage, regardless of the company with which they've been insured. "We're always looking for ways to save our customers money, because we know that the more competitive our product is, the more policies we'll sell. And to create these opportunities, we sometimes need to work within the political system." Mercury, which operated exclusively in California until 1990, has evolved to become a multiple-line insurance organization offering mainly personal auto and homeowners insurance through independent agents in 11 states. "Policyholders depended very much on their agent when we started Mercury 50 years ago," says Joseph. "You know what? While the company has certainly changed through the years, we still depend on our 5,000-plus Mercury agents – and so do our policyholders. And because of my experiences at the start of my career, we train agents in areas that a lot of other companies may not, such as underwriting, claims and even customer service. "I started the company from my home and we've been able to grow it so that Mercury's assets now exceed $4 billion." … Beckley, WV, Joseph's birthplace, is about 50 miles from Charleston. … Both of his parents were born in Lebanon, near Beirut, and were ultimately orphaned. His father went to South America to work on coffee plantations and George's mother came to the U.S. with her brothers. The couple met in West Virginia, where there was a large community of Lebanese immigrants. … "I hope I'll be remembered for the contribution I've made to the insurance industry and the changes Mercury has pioneered that have led to billions of dollars in savings for consumers."